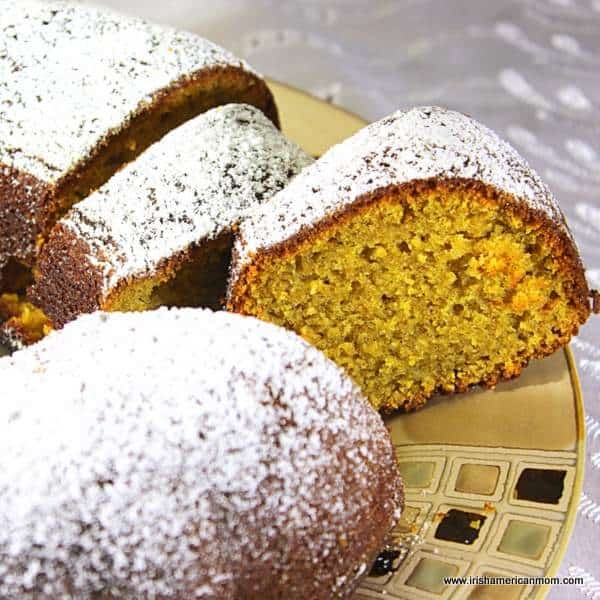 Pumpkin cake is synonymous with fall and a favorite in my house. 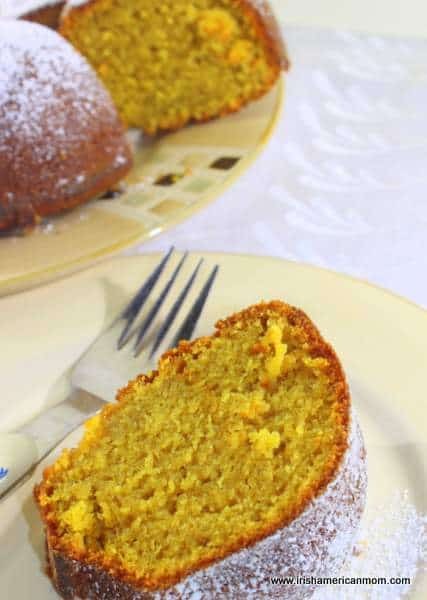 My version of this delicious cake is made with pumpkin purée and a box cake mix. You can’t get easier than that. 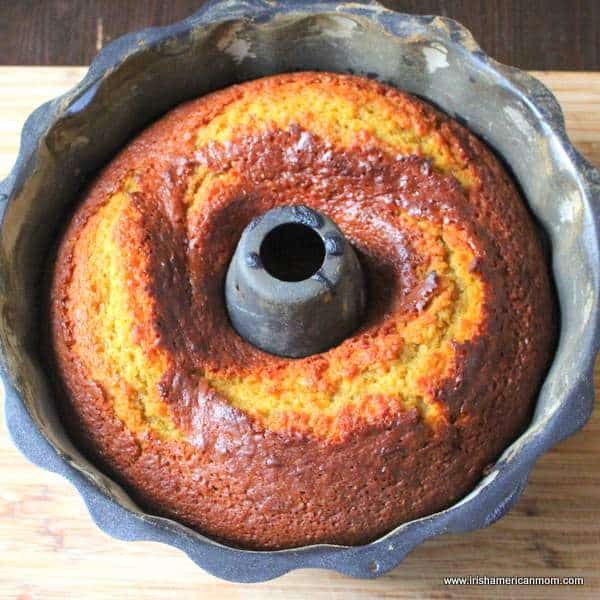 This is a cake not a pie and I find my bundt pan produces an easy to slice cake that all my family enjoy. Now just in case you think I’m always baking from scratch and slaving over the oven, I thought I might share my quick, easy-to-bake pumpkin cake using a box cake mix as the main ingredient. How simple is that! When a cake is in order I can throw this recipe together in double quick time. Preparation time is less than fifteen minutes and it takes only 45 minutes in the oven. The final product is moist and soft with a lovely hint of cinnamon and fall spices, and a real taste of America. This is a recipe I have tweaked over my years in the US and not one from my mother’s Irish recipe collection. However, it will definitely be a recipe I’ll pass on to my children. 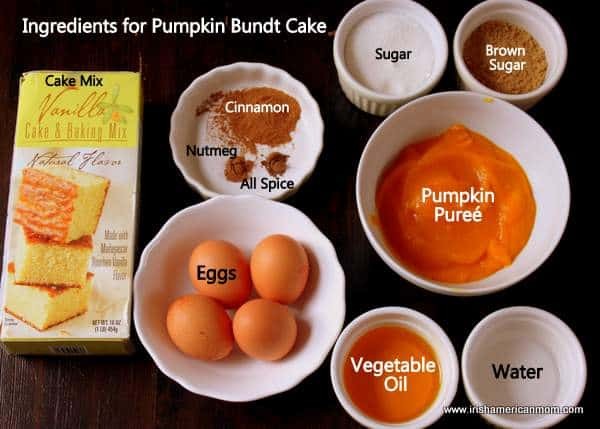 Hopefully box cake mixes will always be available for them to carry on our pumpkin cake baking tradition. You can drizzle the top with icing, but I prefer a quick dusting of confectioner’s sugar. Why add a complicated icing step when the focus of this recipe is to be quick, easy and budget friendly. I used a homemade pumpkin purée, but a cup of tinned pumpkin works just as well. You will also need 2 teaspoons of confectioner’s sugar if you wish to dust the top of the cake for presentation. I also used butter and flour to prepare the baking pan. Preheat the oven to 350 degrees Fahrenheit (180 degrees Celsius for anyone in Ireland). 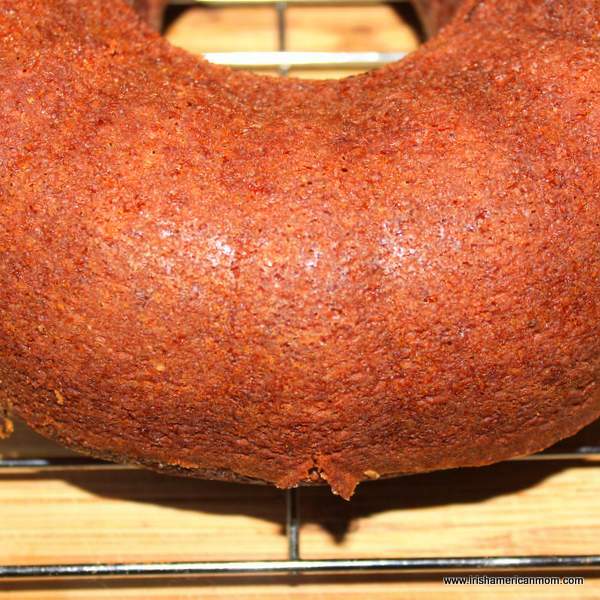 Prepare your bundt pan by greasing it with butter and dusting it with flour. You can spray it with an all-in-one spray like Baker’s Joy if you have it on hand. 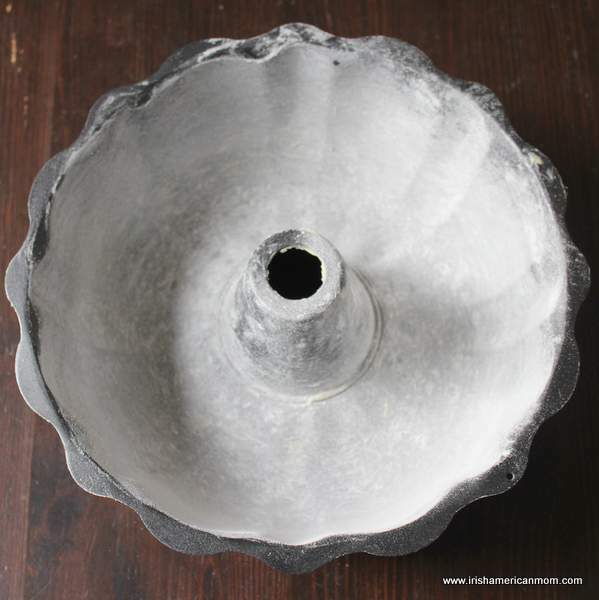 I love how this bundt pan produces a fluted circular cake with a hollow center. 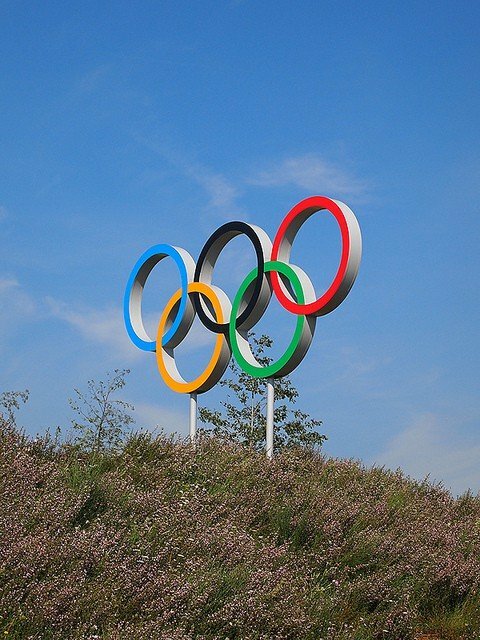 Hats off to the Germans or whomever invented it. 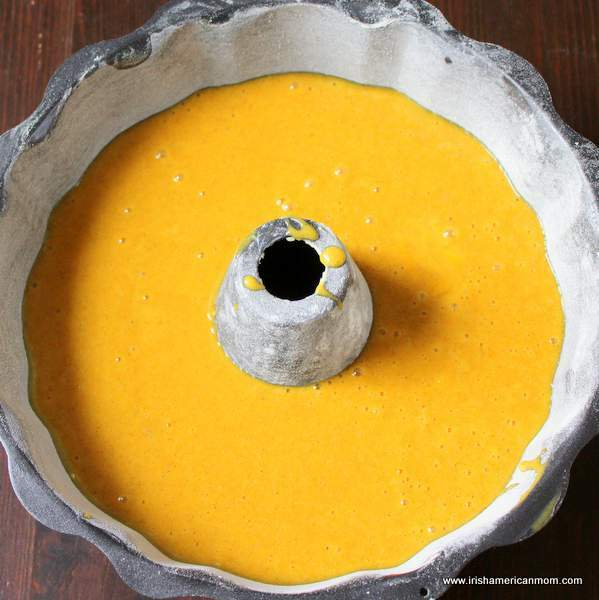 Sift the cake mix and spices into a large mixing bowl. You can skip the sifting if you wish, but I just can’t bring myself to be lazy. 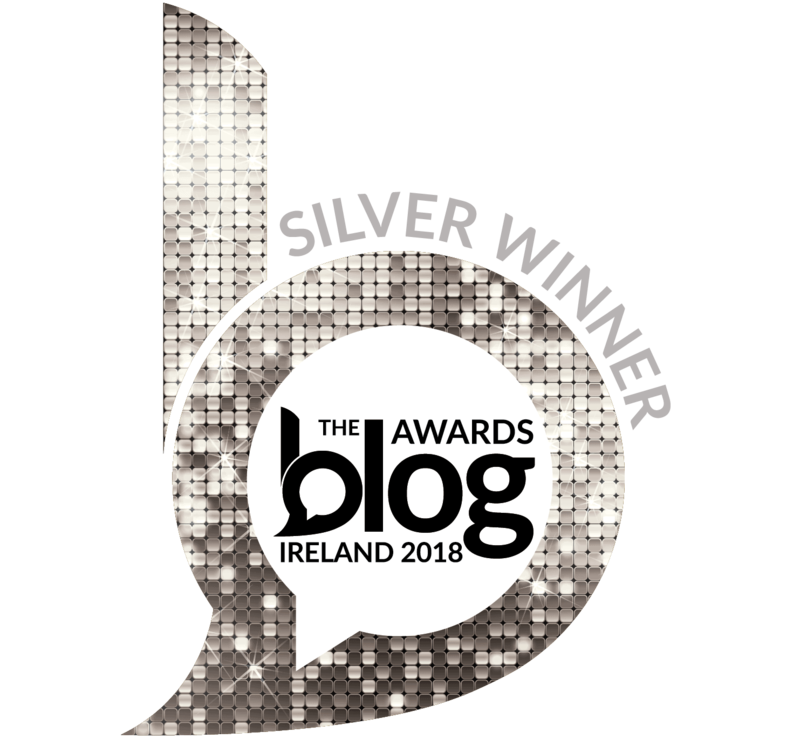 I can still hear my home economics teacher in Dublin lecturing us on the importance of sifting flour. I’ve really taken her words to heart when I even sift a cake mix. Next, stir the sugars into the flour mixture. I use a little brown sugar for my pumpkin cakes since I like the flavor it adds to the final product. 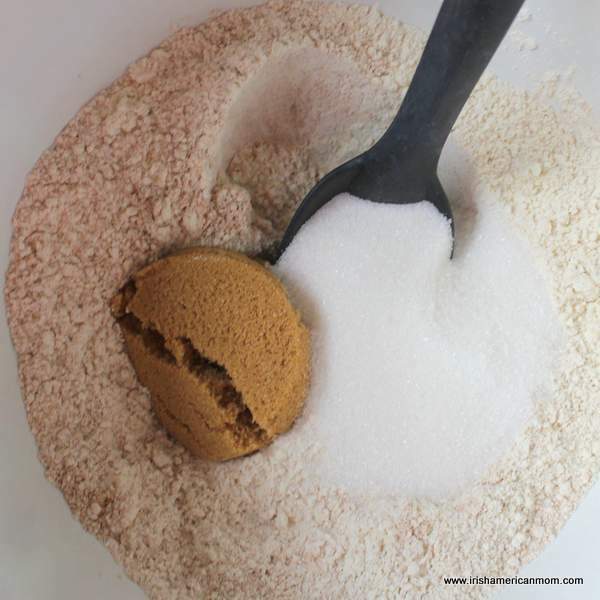 If you don’t have any brown sugar in your cupboard feel free to use all white sugar instead. Now it’s time to prepare the wet ingredients. 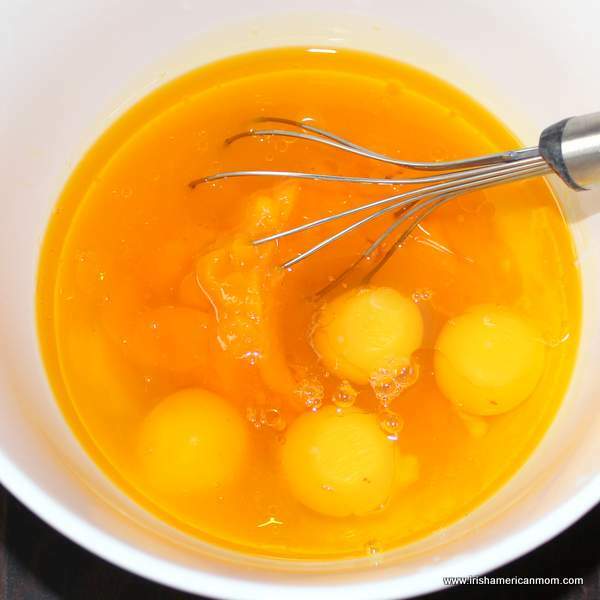 In a separate batter bowl mix the pumpkin, eggs, water and oil. Whisk it together to completely combine everything. The next step involves combining the wet and dry ingredients together. 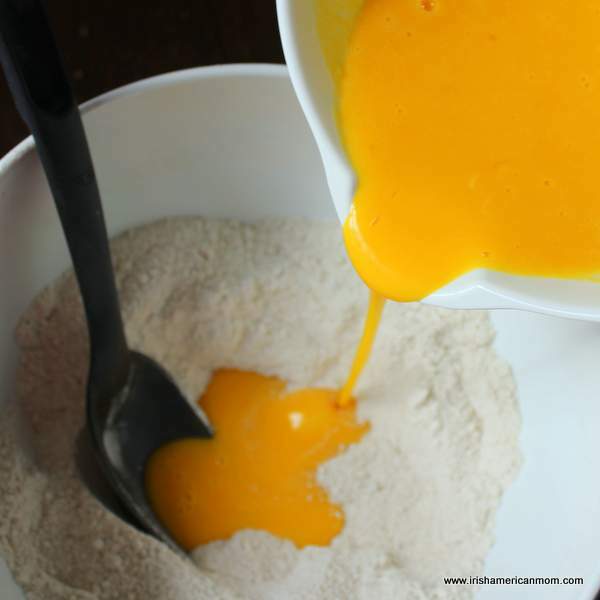 Mix until blended, but don’t over beat the batter. This is quite a wet cake mixture. Pop it into the pre-heated oven and bake for 45 minutes. The cake is cooked when a skewer or knife is inserted and comes out clean. It should be a lovely golden brown color. Let the cake cool in the pan for 5 minutes then turn it out onto a wire rack to cool completely. Slice and eat without any decorating, or if you like a quick fix cake upgrade then dust the top with confectioner’s sugar, or icing sugar as we say in Ireland. This cake is a big hit in my house. And the great thing is that with a whole cup of pumpkin purée in the batter, it’s an easy way to sneak a veggie into my picky eater’s diet. And so this fall I hope you enjoy baking with pumpkin. In fact, I hope you use pumpkin all year round. The cans are always available or you can freeze some pumpkin puree to use after fresh pumpkins are no longer available. 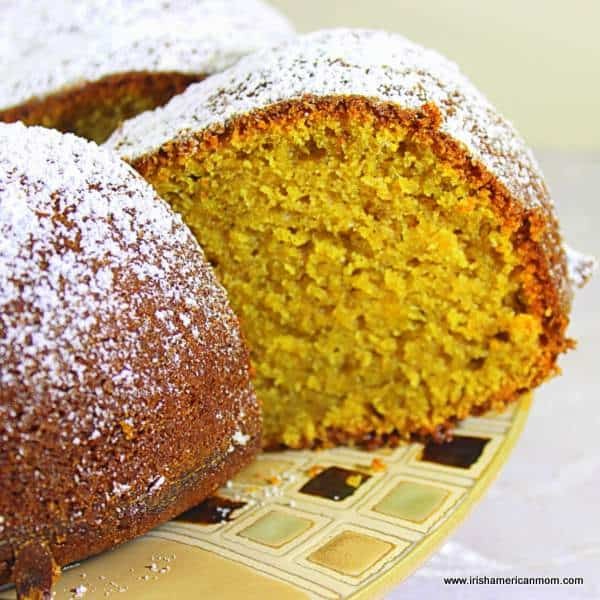 A moist spiced pumpkin cake which is easy to make and budget friendly. The ingredients start with a boxed cake mix. A simple way to create a taste of fall. Preheat oven to 350 degrees F (180 degrees Celsius for anyone in Ireland). 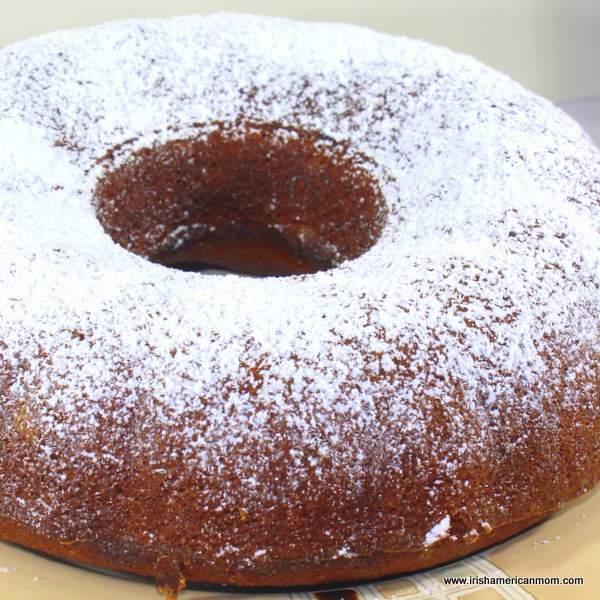 Prepare a bundt pan by greasing it with butter and dusting it with flour. Stir the sugars into the flour mixture. 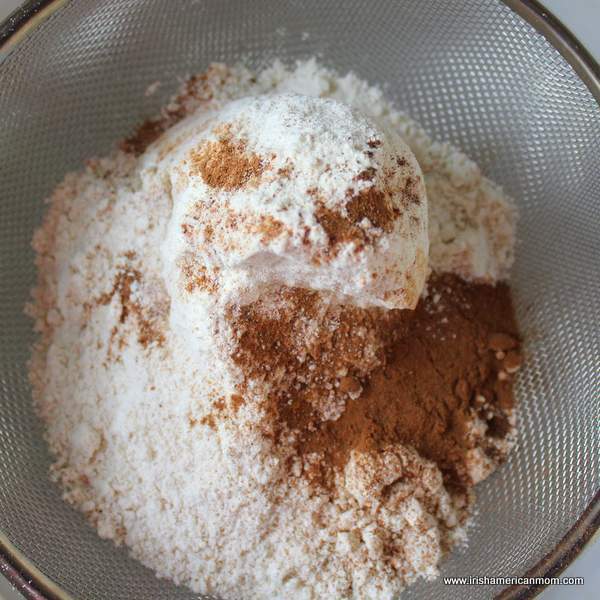 Combine the wet and dry ingredients and blend together with a spoon. Bake in the pre-heated oven for 45 minutes. The cake is done when an inserted knife comes out clean. Cool for 5 minutes in the baking pan then turn out onto a wire rack and cool completely. Dust with confectioner's sugar if desired before serving. Hey! Great recipe, my dear! 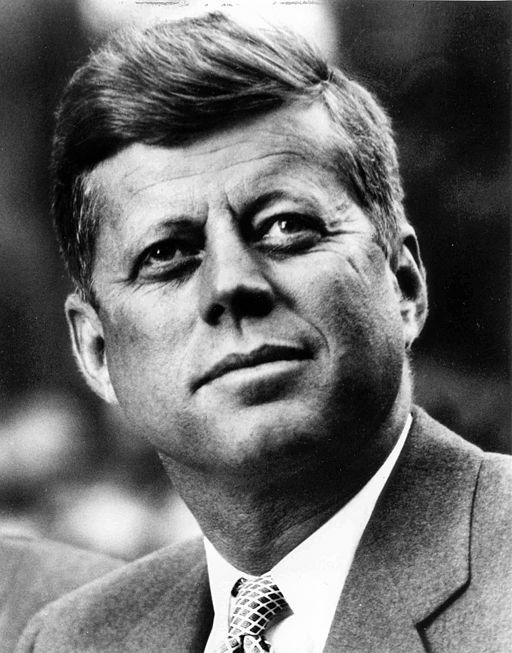 I remember reading about him when he passed away. I think Bundt cake pans are great! Yum, Mairead*! 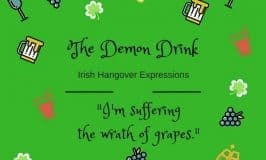 This is a fun and dee-lish recipe! My grandsons just love pumpkin everything! 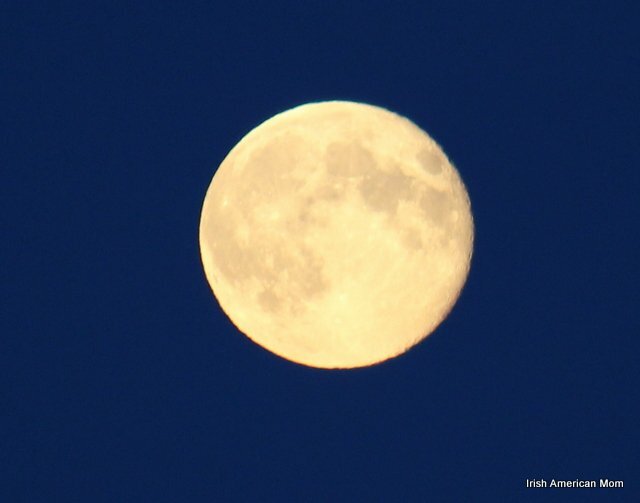 Thank you, Mairead* and God bless you! And the great thing is that pumpkin is so good for us. 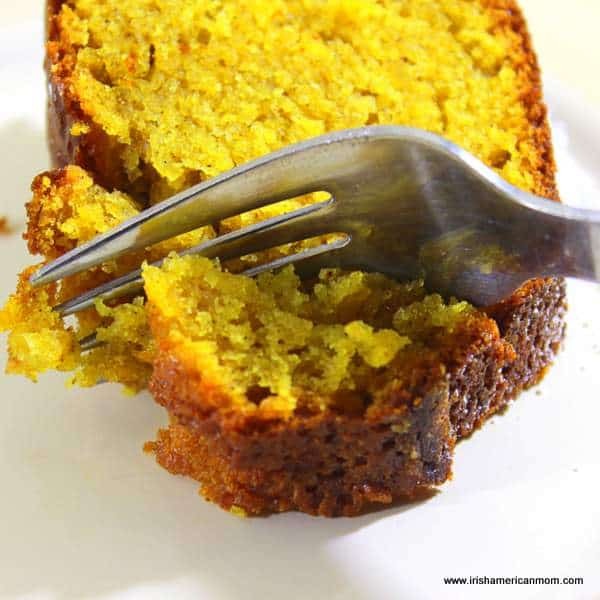 Pumpkin cake is one trick I have for sneaking veggies into my boys’ diet. They’re very picky when it comes to trying vegetables, but they just love pumpkin cake.